"E' calcio" (It Football), we read in the Dictionary of Crusca the seventeenth century, "even the name of a game, and its old town of Florence, like a battlefield ordered, with a ball in the wind, rassomigliantesi to sferomachia, rose from 'Greeks to the Latins, and by' us Latins". Identifiable in ancient Rome called "Harpastum" or "Harpasti Ludus", the exercise of this game is without doubt a great way to keep the legions in good physical condition and morale in winter quarters, considered the "Martis Praecepta" which are applied in it ..
As reported at the beginning, the vernacular term "football" for the first time in the sports lexicon thanks to the academics of Bran (uncertain etymology is clear: the Latin word calx-calcis, or heel, find it the correct interpretation), but the substantial literature on this subject will talk about later. With regard to the rules of the game Pietro Gori (The Celebrations for St. John, 1926) explains that "the men elected to the Football must fifty-four be divided into two rows equal in number and value, and each of these must be divided into fate of four players: The first fifteen Member or Corridori, five Sconciatori, four Employers First three bosses back or rear. " Goal of the game is to make the largest number of "hunting" by dealing with the ball with the feet or hands over the barriers at the back of the opponent. Each ball launched over the side lines is equivalent to a fault, two faults are a fighter lost. Than that at the end of the seventeenth century appeared to be an extremely articulate was the result of a development which lasted three hundred years. The first literary Football is a lyrical nature, a poem probably written between 1460 and 1470 tells a dream in which a woman as beautiful as an angel promises the author to fulfill his every desire, and these can be found on "celestial meadow "similar to the primordial garden and place of nymphs are young men" of where a lor began to speak - ch'aveva a ball in hand blown - and said to another "Vogliam noi giucare?". It followed that on all fields of this world still happens: two captains are selected, these residues are dividon companions and then choose the field that will defend divided once to each team in the roles for the different capacities of each. After the pact which will come out the winner who will do the first three caccie the ball is played. The poem does not provide any spatial information, but according to the names of players: Strozzi, Tornabuoni, or Ranuccini Gerini, there can be no doubt that this dream meadow is in Fiorenza. The most likely hypothesis tends to identify the narrative in John I Frescobaldi, scion of the race of note trecentesca of Oltrarno bankers. Presumably the first football players involved in the majority belonging to the aristocratic class, should not be excluded that a small number of players, always identified by nicknames, belonged to lower social classes, after the annulment of their social barriers was the great peculiarities of the game . The players, usually in the age between twenty and twenty-four years old, not yet adept at cover charges of the government gathered at the roundabout to be seen "and thus draw upon himself the public attention." Given the expensive physical effort, the calcium was normally obtained during the winter period in Carnival (from the back of January to March). It was an integral part of the regular winter entertainment for which it was made only in conjunction chronicle of extraordinary events or emergencies caused by special circumstances. So back Luca Balducci: "And a day of 10 January 1490, ice all over the Arno so that it did on the ball, and arsevisi scope; was great cold." Scipione Ammirato, three generations later, tells us that this happened for three days continuously on a pitch located between the Ponte Vecchio and Santa Trinita. It seems that even the son of the Magnifico, Piero, has participated in meetings on the ice. Moreover Jacopo Nardi in his History of the City of Florence, about 1492, says that Piero, "too tilted to the love of women and playing ball with the fist and with football, you just deal Affairs of State losing pace with the times. Nardi adds that: "for his ability to play many unique throughout Italy were to make with it of that experience," among them some well Sforza from Milan who brought football to the variants in Milan. " Under the regime of Savonarola integrist Catholic, along with all other forms of playful fun to mold Medici, also fell into disrepute Calcio thanks to the strong spirit of war-fighting meetings involving the representatives of districts that were and are, fortunately, is for field layout that hosts the fair for lack of loyalty, more like a crude and manly battles than to honey rides. How to tell the Parenti, in 1497, the year before the stake which was burned to the Bolognese monk, the Quartieri even organized a coup hand in flagrant breach of the Republican game. And there was actually an attempt spearheaded by the offspring of the Nasi and the Hammers but was crushed in the bud by dell'Otto (Otto di Guardia). After the fall of the ascetic fundamentalism of Savonarola Football was again permitted. In 1511, the last year prior to the return of the Medici, as twenty years before, the game is still on the ice and said Bartolomeo Masi "fecevisi Football com'ogni year ago on the lawn in Ognisanti" (the space between Borgo Ognissanti and Porta al Prato). By 1512 the Medici returned the golden tradition, so much so that even Giovanni de 'Medici, who became Pope with the name of Leo X, did not want to give it up and occasionally imported to Rome in the game as reported by Benedict livery Fantini race occurred with regard to the January 7, 1521 when after the dinner had been 65 to 70 Youth Florentine clothes two liveries and they played the socks to dance in Piazza de Bel View about four hours. The Pope was to see the Torre Borgia. " Between 1527 and 1530, the years of 'last desperate struggle of the Republic against the Medici and their allies, offered the known heroic occasions and concluded that the history of football Republican. With precision and detail the great Benedict tells us Varchi with unsurpassed expressions that each year we feel rimbrodolare of each lot, or that famous meeting in 1530 in Piazza Santa Croce in Florence in the siege by the imperial troops of Charles V (exceptionally played nell'affresco siege with a view to flying bird work of Vasari and Stradano (Jan van der Straet) of Clement VII room with the batteries that shoot from the Spanish Giramonte, now better known as the "Round of Cipressi" di Giovanni Spadolini). Describes the Varchi: "yes to no intermetter the old habit of playing every year for Carnovale, and yet pe 'greatest contempt of' enemies, made up the Piazza di Santa Croce a lot ... and a livery pe 'be not only heard but seen, put a part of 'Sonatori with trumpets and other instruments in the chimney of the roof of Santa Croce, where Giramonte was taken lor a cannon, but the ball went high, and did not harm or damage to person ". It seemed to scorn the fact that Alessandro de 'Medici, who buried the Florentine Republic, usasse convene young friends to play football, paradoxically it was the arrival in Florence the daughter of' Emperor of Austria Margaret, betrothed to Alexander that in addition to the usual public celebrations are held a lot of football that marked the turning point: from that moment the old and traditional game became important and often essential in the festivities and familiar state. It was followed by an infinite number here and if they remember only some of the most worthy of mention: in 1558 for the wedding of Alfonso d'Este to Lucrezia de 'Medici, in 1565 in honor of Charles of Austria, in 1584 for the wedding Vincenzo Gonzaga with Eleonora de 'Medici, in 1604 in honor of Ranuccio The Duke of Parma, in 1605 it still played on ice dell'Arno. In 1607 rules were enacted because of severe recurrent unrest among the public, but in 1608 on the occasion of the wedding of Cosimo, son of Ferdinand I, there were still so much turmoil to be involved in some way also celebrated. It 'clear that the enthusiasm for football then had nothing to envy to the modern fan. It was not conceivable without the Carnival Football and the intensity of racing and the passion is not stupid town until the second half of the seventeenth century. In the chronicle of the traveler Lassels of 1670 if it relies on clearly the profound crisis. 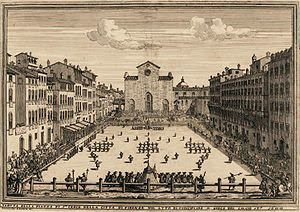 In 1673 Orazio Capponi, Provveditore Calcium, organized an exhibition at the Abbey Fiesolana (there was even Lorenzo Bini, the author of "Memories of Football Fiorentino, 1689) in an attempt to render clear force to tradition, the efforts were rewarded because the games of 1689 did fade the previous intensity and theatrical productions. You can certainly say that the culture of Calcium enriched the life of the court. Incredibly sumptuous was the meeting in honor of the wedding of Anna Maria Luisa de 'Medici and John Duke William of Neuburg in 1691. Still, the Grand Duke Gian Gastone de 'Medici, without heirs, in January 1739 in Florence s'insediò Francis II of Lorraine, husband dell'arciduchessa Maria Theresa of Austria (in honor of which the arch was raised to three tubes outside San Gallo); for the occasion was a game in livery memorable, as the Florentines wished flaunt their most typical way to celebrate. But that was sadly reminiscent of the chronicles, the last played football in Florence. In 1766 the game was already only a memory, and may be said that it had somehow followed the Doctors in their decline. Il Calcio Fiorentino cross borders several times and fed largely successful at the French courts (see the notes of the races in Lyon in 1575 in the presence of Henry II, King of France and Poland) and English (in relation to England after a first Elizabethan the track could be played during indiduare in London in Hyde Park in front of Cromwell in 1654). Certainly the history Football Fiorentino approach for today is not the Rugby Football, but certainly can certainly be considered the cornerstone of contemporary appeared officially starting in 1863 at the Football Association hosted the premises of the Free Mason's Tavern in Great Queen Street in London. With regard to the twentieth century, after the revival of 1930, I find that you go through a period of slow but progressive recovery of the true spirit of the fun. I note with pleasure that year after year, especially with greater awareness and in new generations, we are gradually recovering and seeking some essential values and symbols in an unpredictable public until some time ago. Especially surprising risen attachment to their traditional habits of generations distant from our own and often incondivise by our fathers. 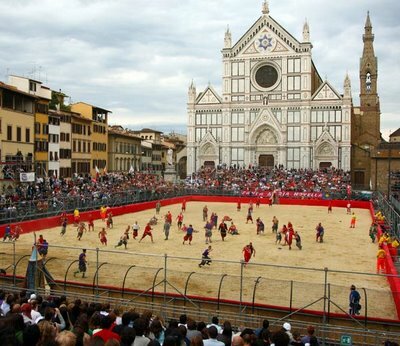 Finally my deepest hope is that progress is made in less Soccer Fiorentino as historical and reference is made quite as unmissable event for anyone with Florence and its traditions in the heart. Commenti Offensivi, Spam o Link verso altri siti non verranno pubblicati. Castelluccio di Norcia Fioritura 2018: Quando C'è? E' possibile andare?